ATP announced today that Tonya Susann Hodson, from Salina, KS is the recipient of a 10-hour Multi-Engine Instructor Rating Scholarship to be presented at the 24th annual Women in Aviation (WAI) Conference taking place this week in Nashville, TN. 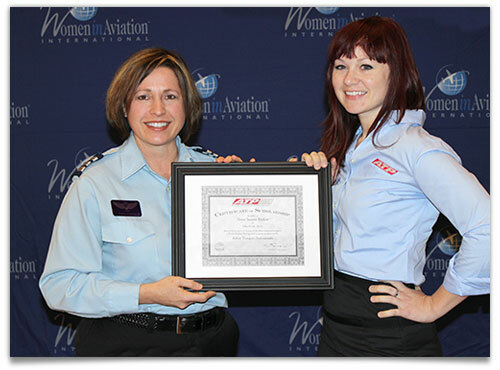 The presentation of this award represents a continued effort by ATP to support the work of Women in Aviation and its members. The scholarship awarded is valued at $4,000. Tonya Hodson, left. Courtney Dennis, ATP, right. Tonya Susann Hodson is a student of Kansas State University in Salina, Kansas who anticipates graduating with Bachelors of Science in the Professional Pilot program in December of 2013. She currently holds commercial pilot certificates for both single- and multi-engine aircraft is working on her flight instructor certificate. A Dean's Honor Roll student, Tonya has also been active as an Air Race Classic Top Ten Competitor, a competitor in and organizer of the National Intercollegiate Flight Association's SAFECON Safety Conference, and has taken both formation and aerobatic flight training. When asked about her aviation career goals, Tonya said, "in five years I will be employed in the aviation industry sharing my experience and expertise. In ten years, my career will be secure providing training and instruction through knowledge, leadership, and passion.” Tonya wants to give back to the aviation industry in every way she can. "ATP recognizes the importance of supporting students and especially the next generation of female aviators," said ATP Vice President, Jim Koziarski. "The recommendations of faculty at Kansas State University highlight Tonya's professionalism and the passion she brings to her aviation career goals, making her a recipient I know ATP will be proud to help succeed in aviation."